Andrew is a cheerful and honest person with strong communication skills. And with years of pipe smoking experience under his belt, as well as four years of fine arts study, and a few years of experience in the antiques business, he has a natural eye for pipe aesthetics and a firm knowledge of the market. 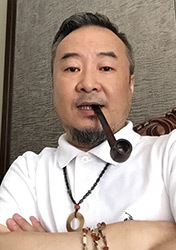 He brings his knowledge and personality to our Smokingpipes.com Chinese Representative Office as Manager, overseeing the processing of orders, providing over-the-phone and online assistance, and always striving to better serve our Chinese customers. In his spare time, he enjoys playing the acoustic guitar and cooking.